All practices and races live on the BBC Sport website and on BBC Radio Ulster; Highlights on BBC1 NI on Friday 16 May, Sunday 18 May and Monday 19 May. 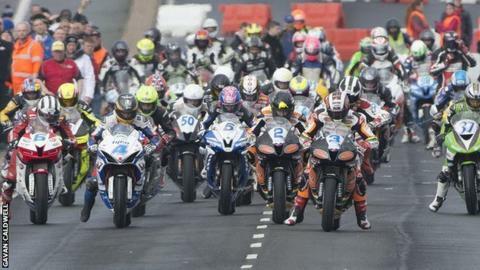 I always get excited when North West 200 time comes round - this year is no different and I expect some of the closest racing we have seen for several years. It would take a brave man to predict a winner with any confidence as the quality of the entry is just so strong in every class. There is a bit of luck involved in winning any race and it's a real team effort, starting with the guys in the paddock preparing the machine, the tyre manufacturers playing their part, and then the rider is the icing on the cake. It's important to get the right set-up and have the most suitable tyres on for every race, then when it comes to racing, you have to dig deep and push hard. Ultimately, it usually boils down to the Coast Road section from Metropole to Juniper Hill on the last lap and that's what makes it so exciting. The manufacturers are pretty closely matched these days, and while Honda maybe don't have the fastest Superbike machine on the grid at the moment, they still have a strong all-round package and a very good track record on all the road circuits. The Yamahas and Kawasakis should be right up there too, Suzuki have an experienced team behind them with the Tyco TAS boys, while the BMW is renowned for being very fast in a straight line. The return of Josh Brookes for a second year adds extra excitement and although it would be a big ask for him to win, he's a very good all-round rider and I wouldn't be surprised to see him on the podium. As well as being talented, he's very professional in his approach and has a winning mentality wherever he races. Alastair Seeley makes no secret of the fact that he wants to dominate the North West and I like the fact that he's only interested in winning. Having said that, no-one is more determined than Michael Dunlop and hopefully he'll be good to go after suffering an arm injury at the Brands Hatch British Superbike round last month. The North West circuit isn't all that physically demanding anyhow, although he may suffer from having had a lack of dry track time on the BMW. Ian Hutchinson is a bit of an unknown quantity - he regained his taste for success by winning the Macau Grand Prix and while he has been struggling in British Superbikes, the roads are a very different proposition, so I expect him to be knocking on the door for podiums. John McGuinness should be on the pace again as he has taken time out to recover from a broken scaphoid, but I'm not sure if Michael Rutter is still a potential winner at the North West. He's still fast and a rostrum place is certainly a possibility, but he may stand a better chance if conditions are not perfect. You can never rule out Bruce Anstey either - he seems very much at home in the Padgett's Honda outfit, his style of riding suits the roads and I would expect him to go especially well in the Supersport races. While most riders have a full stable of machinery to set up and qualify, Stuart Easton can focus his efforts solely on the Superbike races and it's quite conceivable that he could win both. He's light, he's been in good form on the circuits and the Paul Bird Kawasakis are really good bikes - the fact that he has plenty of experience at the North West will stand him in good stead too. William Dunlop should be a strong contender in the Supersport races in particular and he is very fast if everything is perfect and he's in the right frame of mind. The TAS team build a good bike but unfortunately I feel that the Suzuki isn't the best bike out there and I'm not sure if it's strong enough to win. William's team-mate Guy Martin will attract plenty of attention as usual but he's had a few crashes at the North West and hasn't been at the sharp end of things for a few years. Whether he can be in a position to give it that little bit extra on the last lap remains to be seen. Conor Cummins is a rider still regaining his confidence after a horrible accident at the Isle of Man TT in 2010, and while he is getting faster, he's still getting mileage under his belt and he'll perhaps be in a stronger position to do well at the TT. He suffered another setback when he was taken out at the Mather's Chicane two years ago and while most of the competitors would prefer the chicanes not to be there, they are vital from a safety point of view and help the organisers attract the bigger names. The North West was always one of the biggest events of the year for me as a rider and while you miss being out there competing, the thing I really miss is winning. I'm still very much involved as a member of the Safety Panel and the Rider Liaison Committee, primarily looking after the newcomers, so that at least allows me an opportunity to still ride the track under closed road conditions. I've also been given a greater insight into the level of organisation required to get the show on the road and the inevitable frustration when the weather spoils things for everyone. The atmosphere is always good, even if the weather is not fantastic, as there is so much happening throughout the week. The event is starting to attract a lot of people from central Europe, which can only be good looking to the future. The Supertwins class appears here to stay and while they are not the fastest bikes, they offer up some close racing and are a good starter class for the young lads coming through now that the two-strokes are no longer part of the programme. They're not as aggressive as the Superbike, Superstock and Supersport classes but the fact that a rider like Jeremy McWilliams has delved his toe in the water and done a fantastic job has added interest to the meeting. The return of Ryan Farquhar and Keith Amor, who have come out of retirement, also brings a bit of extra spice. I've always been a believer that when you make a decision you stick to it, but everyone has their own perspective. I can understand that Ryan has his own team to promote and sponsors to keep happy, perhaps he feels the best way of doing that is maybe to ride himself, but I'm totally in the dark as to why Keith has changed his mind. He'll have his own reasons I guess.